Girl in Park with Tablet. Playing Tablet While Lying in the Park. Fall is here and our children will spend more and more time inside. Most probably in front of different screens playing games. But the classic TV and computer screen are slowly but surely being replaced by smartphones and tablets. Of course parents would like their children to know their way around the devices of the future, but they still want them to be active and play and… well… be kids. A small team from Europe came up with an innovative solution that combines both. 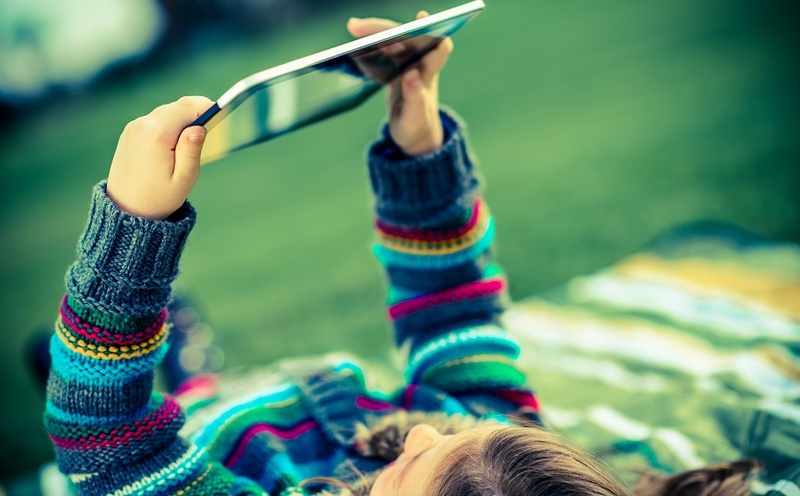 Studies show that 3/4 of all US kids have access to mobile devices at home and the time spent playing games on these screens has tripled in the last couple of years. One of the most alarming consequences of the explosive rise of modern technology and associated screen time is that children are rapidly becoming overweight and inactive. Children who spent at least 60 minutes in front of the screen were 39 % more likely to become overweight and 86 % more likely to become obese. Consequently, there’s not a parent around who doesn’t feel slightly guilty about seeing their kids veg out on their smartphones or tablets. Taking the “magical” devices away from them often causes a lot of screaming and crying… So what can you do? A small team from Slovenia decided that instead of going against the grain, it is better to add a physical feature to the gaming aspect, which turns pointless gaming into a beneficial activity. 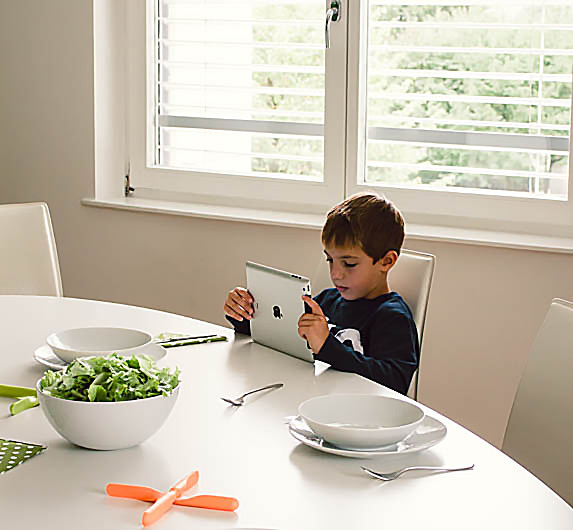 Parents of two small kids, Urša and Niki Popovič, developed the world’s first wireless balance board for playing games on tablets and smartphones – Swingy. It is made of wood and designed for children aged 4 to 12. 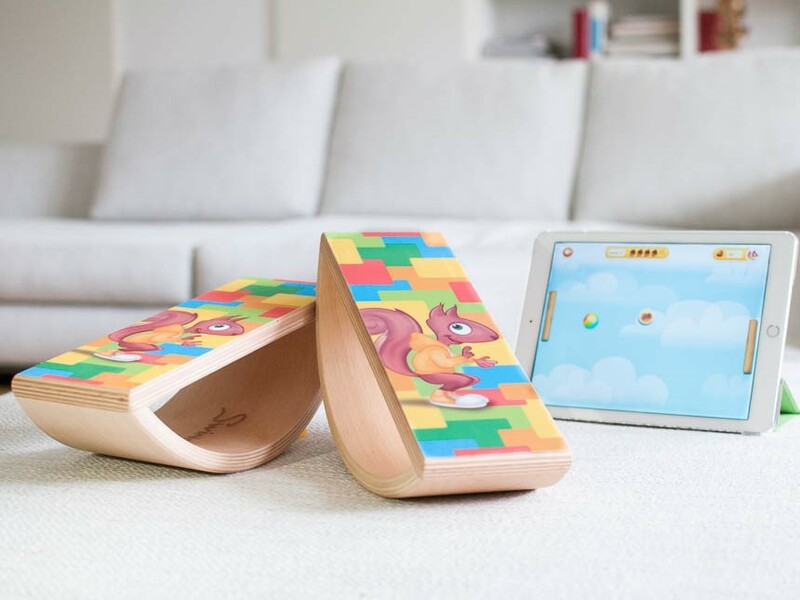 Swingy stimulates children to move while playing digital games, enhances their sense of balance, and improves their coordination. Child’s play is an important source of physical activity and motor development, especially in the first years of life. And balance is the pillar beneath every motor skill we have. Children develop their vestibular system, also known as the balance system, up to the age of 15. Swingy was developed in cooperation with doctors, teachers, and exercise physiologists. With its curved form and back and forth movement, Swingy strengthens the core muscles required for a healthy posture and improves balance and coordination. And we all know that improving balance helps children in everyday life as well as at sports such as rollerblading, biking, skating, climbing, and skiing. The Swingy balance boards are equipped with sensors that wirelessly connect to a tablet or smartphone. Each balance board controls one of the parameters on the screen. This means children are playing digital games with their legs. The first game the team developed is called Swing Pong. The goal of the game is to keep the ball in play by intercepting it with one of the sliders. Power-ups randomly appear on the screen in the shape of forest fruits and animals. If you would like to know more about Swingy you can check out www.swingy.net or look them up on Facebook. From October 14 you can also get your own Swingy or support them on Kickstarter. Yahoo Messenger 10 features enhanced video calling, improved language support with an….